Liquid solution cures in seconds with UV light applied. Creates a long-lasting and durable bond. Glue only hardens when UV light is applied, preventing the common hassle of removing hardened glue where it was applied by mistake. Water resistant and heat resistant. 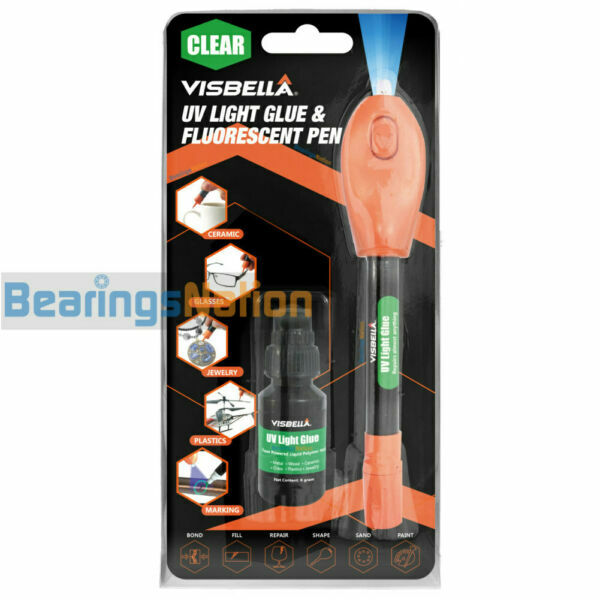 Visbella UV Light Glue is more powerful than super glue. It’s a powerful liquid plastic welding compound that you can easily and quickly use to make making permanent seals and repairs on almost anything. It can be applied to plastic, metal, wood, rubber, PVC, ceramic, glasses, jewelry, toys and so much more in 4 easy steps: Clean, Apply, Cure, and Shape. This easy to use pocket-sized tool helps you to complete everyday repairs on-the-go with minimal time and effort. It’s also a powerful tool enables DIYers to be creative at their projects. STEP 1: Clean the surface of the targeted area from any dirt, grease, oil, or other contaminants with a cloth. Make sure the area is dry afterwards. STEP 2: Apply a thin layer of the SUPER UV Glue solution to surface of the object you are trying to bond. Carefully put the applied surface onto the surface of the object you are trying to bond it with. STEP 3: Make sure the objects are either on a stable surface or in a stable setting. Use the provided UV light pen and shine the light in between the two surfaces in which you are trying to bond. (TIP: Aim the UV light on the liquid, not the object). STEP 4: The liquid should solidify in a few seconds after the light is shined upon it. You have now successfully merged your two objects together! Accepted payment methods: Paypal, Credit Cards by Paypal. Most orders are processed and shipped out within 1 business day. We take good care of outgoing packages to ensure products can be delivered smoothly to you. We offer 60 days return guarantee! Items can be returned 60 days within the original order date. Buyer is responsible to pay for and ship the items back to us for a refund. Buyer must request RMA Number from us and included inside the return package in order for a refund to be issued. All returns without verified product issue or without following Return Instructions are subjected to 15% restocking fee. Original Shipping cost is not refundable. However, we asked to be advised of product damage or defect upon receipt of the item. If the item is found to be faulty by our inspector, original shipping cost paid by the buyer will also be refunded. We work directly with top certified manufacturers and bring quality products to the marketplace for the benefits of online buyers.